2017 is full of new B2B marketing trends. This year, it’s all about embracing tech and eliminating barriers. That tech includes everything from video marketing to virtual reality experimentation. The barriers could be the ones between content and social media; content and email; or just about anything else that includes cross-platform promotion. So what are the biggest changes coming our way in 2017? We’ve noticed 10 changes that we think will have a dramatic impact throughout the year. There are more — but these 10 will have the biggest impact. The secret is out — content marketing is amazing. As a result, companies are rushing full-force into new content strategies that’ll add to a saturated information market. That’s not necessarily bad. Some industries still have a lot of breathing room when it comes to quality content, and competition typically spurs innovation. But the content marketplace has been saturated for at least a year now for popular industries, especially in the tech field. That kind of hyperactive competition — where companies pile on top of already-established niches — is more indicative of a bubble than regular competition. We’ve talked about market bubbles before, but let’s apply that lens to content marketing. First, we have to establish the five major events of a financial bubble. Displacement – The creation of an idea & its early success. Boom – The mass adoption of that idea. Euphoria – Earning & popularizing an idea; the “golden age” of a bubble. Profit – Forward-thinkers earn from bubble, ditch assets, and start looking for next idea. Panic – Those left behind don’t earn nearly as much as before; idea is ditched en masse. Most of these steps sound good on paper. But they all lead to the same end result — a burst market bubble. In terms of content marketing, displacement occurred when Google got so good at recommending search results that companies realized they could write information, publish it on their site, and get new customers for practically no cost. The boom happened when people started talking about it. Everyone wanted in on this new-fangled content marketing idea. Euphoria occurred when everyone was making money off of content. It was the golden age that also saw the rise of third-party specialist companies like Content Marketing Institute — kind of like how SEO spawned Moz. Profit is happening right now. Lots of companies are earning off of content marketing, and a lot of them are ditching text-based content altogether in favor of new marketing strategies (or at least new content formats). With that in mind, panic is on the horizon. That’ll be when the value of content — especially text-based content — stops earning returns. Considering how easy it is to write content, this panic moment is probably closer than marketers would like to admit. In fact, you can already see thought leaders changing their content strategies. Content is popular, and everyone wants to get theirs while the gettin’ is good. But only 6% of content marketers consider themselves to be “sophisticated” in their methodology, according to a study from Content Marketing Institute. That top 6% is in a prime market spot to jump to the next big thing in content marketing and leave their competitors behind. They’re probably the marketing agencies and big brands that have dollars to burn. The mature 22% is probably doing a little experimentation of their own. They may not have the big budgets of the top 6%, but they’re getting along just fine and enjoying the profits of their work. But, just like the 6%, these companies are also looking for the next big step in content marketing. They just want someone else to test everything out first. With that in mind, the bottom 72% will be hit hardest by a burst content bubble. They’re the ones who are lagging behind the most, and they probably won’t have the budgets to jump to the next phase of content marketing like the trailblazers before them. The bottom 10% — those taking their “first steps” — are in the most danger of losing out. They’re attempting to break into a hyper-saturated content market when major thought leaders are thinking of ways to get out. On the one hand, that may reduce the content market’s saturation so that smaller brands can actually get recognition. On the other hand, it opens the doors for more advanced forms of content to decimate the bottom 72% — especially if that 72% is only using text- and image-based content. But there’s still one big question: What are thought leaders doing now that others aren’t? Over the past few years, video has exploded onto the content marketing scene. Video has a number of natural advantages over text — it’s easier to consume, it’s easier to show, it has the potential to go viral, and Google loves it. At WebFX, we launched our first full video marketing strategy in the middle of 2016. Since then, we’ve seen some outstanding results when targeting high-value keywords. 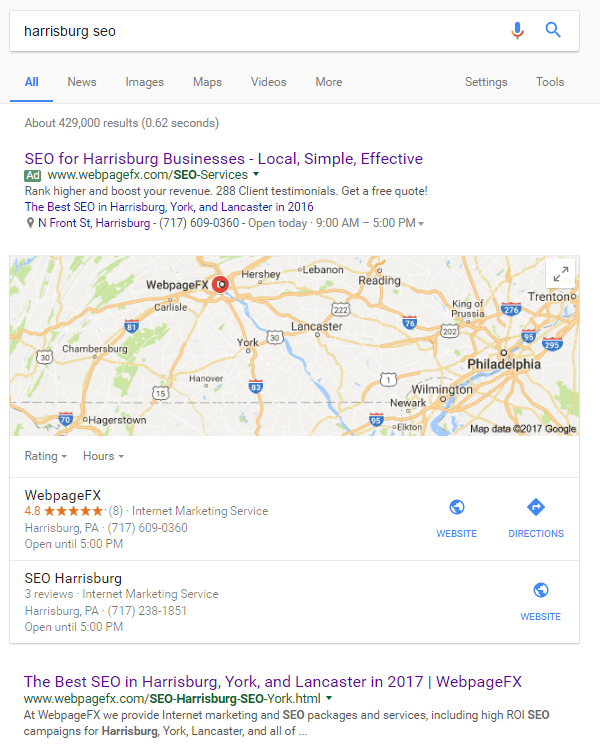 We even outrank Moz, Search Engine Land, and Forbes for some keywords, which is pretty good for an agency in small-city Pennsylvania! We’re not the only ones enjoying the benefits of video, either. Look up your industry’s major keywords in YouTube, and you’re sure to find someone talking about issues related to your business. If you haven’t started a video marketing strategy, the time to start is now! As any Six Sigma participant can tell you, every step of the production process has waste. It’s a universal truth that applies to everything from thermodynamics to marketing. At some point, you’ll lose money, energy, and other tangible needs required to do what you want. The goal is to lose as little as possible every time you invest in a new initiative. If you want to stick to Six Sigma Black Belt rules, you want to strive for 99.96% efficiency, or 99 cents of each marketing dollar going straight into an initiative. In marketing, waste happens whenever someone has to take their time away from promoting your business. That happens most often because someone doesn’t have the resources or planning to fully follow through with their ideas. The general solution is to provide as much time and as many resources that your marketers will need to complete a task. This is a challenge, depending on the marketing medium you’re using. Text-based content is pretty easy since it’s mostly based on data and a marketer’s writing talent. Graphics and video can be more difficult since they may require collusions between your marketers and freelancers (or at least one more person at your business). For initiatives like SEO, PPC, and email marketing, it gets harder to identify points of waste. That’s because they require more data collection and analysis than other marketing strategies. That makes it a lot harder to say you only want to invest in X amount of hours of SEO and PPC optimization. In those cases, it’s a lot easier to identify waste in hindsight, record it, and look for it in the future. For example, if someone on your team spent hours optimizing the text of an AdWords ad in an attempt to lower bounce rate, you can almost certainly identify points of waste. A high bounce rate points to a problem on an ad’s landing page since a user has already clicked the ad — the text is probably fine. While it doesn’t help to hover over every marketer’s shoulder as they’re working, identifying points like the example above can help you both save and earn money by spending it more efficiently. If you find enough areas of improvement, you might be able to hit that Six Sigma benchmark with your marketing team. Personalization is a multi-tiered strategy based on appealing to a specific person instead of a grouped demographic. That includes using someone’s name and speaking directly to their needs as a customer. It’s a little tricky to get started, but the right personalization software can make the difference between average and exponential growth. By examining a user’s IP address and cached browser data, high-powered personalization software can serve tailored pages to different people in different industries. At WebFX, we help our clients do this with our proprietary software called PersonalizeFX. 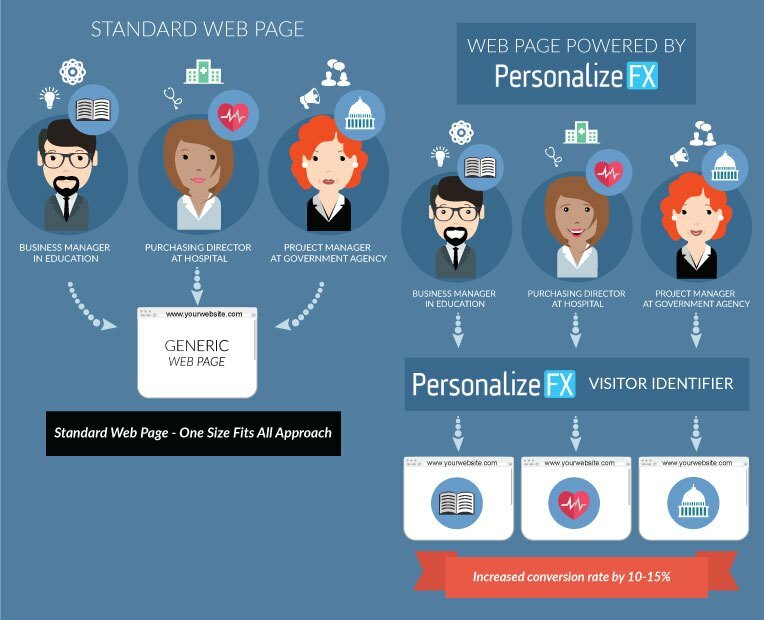 In general, personalized pages earn somewhere between a 10% to 15% increase in conversion rate, which is huge for any business. Whether you work on quick sales or lead generation, not one business would say they don’t want a 15% increase in conversions. That’s why personalization is such a big deal for this coming year. Like content, marketers have discovered how powerful personalization is, and now they’re using it to grow like never before. So if personalization is following the same steps as the content “bubble,” this is probably the boom phase. In other words, if you haven’t started using personalization yet, start today. Account-based marketing is a similar idea to personalization. The difference is that in account-based marketing, you get most personalized information straight from the user. This is why companies like Facebook want users to tell them so much about themselves. By customizing a user’s experience based on their information, you increase the chance they’ll stay on your site. As any marketer can tell you, every second someone is on your site is another second they may convert. You can implement this for your B2B with some high-level web development to empower your site visitors with customization options. This also gives you the chance to collect proprietary data on who your best customers are, where they work, what they specifically do, and why they shop with you. All of that comes from one marketing initiative, which is why accounts have become so popular for almost every website in the world. This strategy is so effective that it’s used in analog marketing, too. Just think about the last time you shopped at a grocery store — you needed a certain card, didn’t you? Setting up that kind of account-activated marketing doesn’t happen overnight. But the results speak for themselves as you earn more customers, especially repeats. The idea behind synergy is to make something greater than the sum of its parts, which is why we chose this photo heading. With Internet marketing, almost every strategy can work with another one to produce better results than using either strategy independently. The best example of this — and usually the first one new marketers experience — is SEO and PPC. SEO is ideal for steady growth and long-term results, while PPC is perfect for quick growth and short-term results. Combine the two, and you not only get the best of both worlds — you also get search saturation. Add local SEO on top of that, and you get a lot of search saturation. The result of using all three strategies together is enormous. You don’t just have a search listing at #1, you don’t just have an ad in the top position, and you don’t just have maps results — you have all of them working at the same time! That means if someone wants to see one of your competitors, they have to scroll down the page. It may not sound like much, but why would someone scroll when they see your company listed three times? Marketing agencies especially have discovered the value in this since the results are so powerful. The uses go beyond simple site traffic — they also extend to reputation management, brand awareness, and even CRO. With that in mind, expect to see single-brand dominance on a lot of keywords in 2017. If agencies are ramping it up, you can bet they’re doing it for their clients too. As more B2B companies adopt social media, the need for social lead generation has grown. LinkedIn is the best example of this since it’s one of the most valuable social networks for marketing. Already, 94% of B2B marketers distribute content via LinkedIn. That’s probably why 80% of B2B social media leads happen to come from LinkedIn as well. And it makes sense — LinkedIn is for professionals, so it’s the ideal place to reach B2B customers. Combine that with LinkedIn’s 2.74% visitor-to-lead conversion rate, and you have a social network that’s just waiting for more B2B marketers. You don’t have to rely on LinkedIn organic reach to get new customers either. LinkedIn has its own PPC system that’s highly-targeted and exceptionally lucrative for B2B companies. Dropship ecommerce has become one of the most popular ways for any company to make a quick buck — including B2Bs. The idea is that you have a popular website, you process orders, you send those orders to a vendor, and then the vendor ships the product. That gives you — the website owner — zero inventory, very little overhead, and fewer responsibilities in the eyes of the law. Basically, dropship ecommerce acts as a cash register. The owners are middlemen who help popularize a vendor’s products, and they earn a decent profit on every item without actually handling it. All of that makes dropship ecommerce one of the easiest business models in the world. Anyone with an idea and some marketing knowledge can make an ecommerce website mildly successful, and there’s almost no initial investment to earn back — at least compared to conventional retailers. That’s why the online world can expect a surge in dropship retailers in 2017. Pretty much anyone can do it, and with only the market to regulate the industry’s growth, there are sure to be some great new businesses and some bad ones. If you’re a B2B ecommerce retailer, keep marketing and building your online presence. The best way to beat the coming competition is to have a solid SEO plan in place, complemented by as many other strategies as you can create. If you’re just breaking into dropshipping, look into PPC and other paid methods to promote your site at first. Otherwise, you’ll have a hard time showing up in search results for your vertical. At the start of 2017, virtual reality is the next major frontier for marketing. VR itself is still developing, so it’s hard to say how marketers could use it to earn a profit right now. Mark Zuckerberg and Facebook have invested more than $250 million into Oculus Rift, their VR branch, to create content. Zuckerberg himself believes VR’s future lies in social media. If that’s the case, then there will almost certainly be coming VR options for Facebook ads, specifically. But those will most likely come after Facebook launches its VR branch in general. Zuckerberg’s philosophy on creating Facebook was to get users and make it cool before monetizing, so it’s possible VR Facebook marketing is still few years off. That’d be great and all, but Facebook isn’t the only company working on VR. In that sense, Google has already monetized VR as every YouTube video is VR compatible. That means their ads are compatible as well, so VR monetization is already here! But with that in mind, VR isn’t necessarily for everyone. It’s not a catchall like a text AdWords ad. Google’s short article on VR and advertising brings up four questions that you can use to tell if VR is the right choice for you. Will VR give viewers an experience that they otherwise couldn’t have? Could you give shoppers a better feel for your product? Will viewers want to continue watching beyond the initial “That’s cool” moment? All four of these questions are great to ask for any B2B company. B2C has it easy in this regard. They just need to appeal to consumers. But B2B requires you to be much more personalized, targeted, and specific. You have to appeal to the nature of someone’s business — not just a hobby they may happen to have. That means B2B may have a few issues getting off the ground with VR advertising. But that doesn’t mean it’s impossible. All it’ll take is some potential, determination, and creativity. Have you started any of these 10 strategies yet? Have you utilized any of these strategies for your business yet? Have you seen any results? Let me know in the comments! Turning Abandoned Carts into Sales: Getting Started with Email Remarketing	What is Multi-Channel Marketing – and How Can You Do it?